I loved this collection. I absolutely adored it actually. I am so glad I picked this up to read during the bulk of my exams because it was just so beautiful to read a couple of stories before curling up to sleep! I initially picked this book up a few months ago, simply because I loved the cover. I don’t often do that, especially when it’s a £20 book but this was so worth it. If you haven’t seen the book in person, you really ought to check out out because it genuinely is one of the most beautiful books I’ve ever had the pleasure of looking at. Anyway, the stories in this book are very short, and the font is relatively big and it is just a pleasure to read. Duffy is a master of language; the adaptations of well known fairy tales mixed in with new stories of her own creation leads to a wonderful collection that is perfect for the slightly childish grownups among us. The original fairy tales (Anderssen and Grimm’s) were quite dark, most people are aware of the fact that Cinderella was not nearly as pretty as Disney painted it. Duffy does echo the format of these traditional tales; there is violence, questionable morals, things are black and white, good or bad – there is no in-between or shades of grey. There are also beautiful, black and white, illustrations which are so intricate… gah. I cannot express how much I loved the publishing of this book. It wasn’t perfect, there were a few stories that were 3/5, some that were 5/5 so ultimately for me this is a 4/5. This looks like it would be right up my street. I can see why you’d pick it up based on the cover alone. 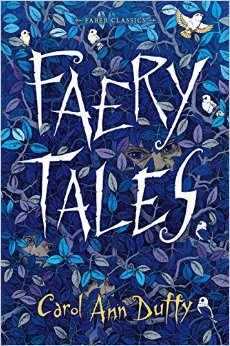 I love stories based on fairy tales and really enjoyed studying some of them when I did my Children’s Literature course.